This time, we will complete the rewriting of the source code. Because Matchers are really C++ code, we can extract them into variables and compose them into multiple other Matchers, as done here with nonAwesomeFunction. In this case, I have narrowed the declaration matcher to match only on function declarations which do not start with awesome_. That matcher is then used once with a binder addAwesomePrefix, then again to specify the callee() of a callExpr(), again binding the relevant expression to the name addAwesomePrefix. Because large scale refactoring often involves primarily changing particular expressions, it generally makes sense to separately define the matchers for the declaration to match and the expressions referencing those declarations. In my experience, the matchers for declarations can get complicated for example with exclusions due to limitations of a reflection system, or with more specifics about functions with particular return types or argument types. Centralizing those cases helps keep your refactoring code maintainable. Another change I have made is that I renamed the binding from x to addAwesomePrefix. This is notable because it uses verbs to describe what should be done with the matches. It should be clear from reading matcher bindings what the result of invoking the fix is to be. 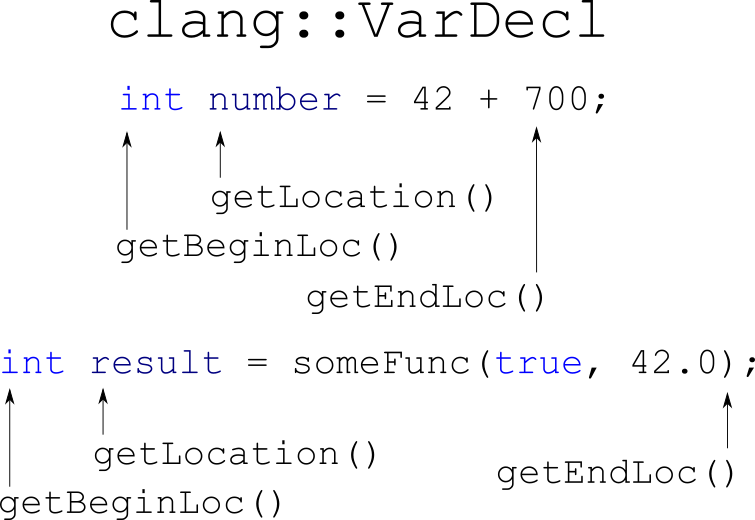 Binding names can then be seen as a weakly-typed string-based language interface between the matcher and the replacement code. Because the FunctionDecl and the CallExpr do not share an inheritance hierarchy, we need separate casting conditions for each. Even if they did share an inheritance hierarchy, we need to call getLocation in one case, and getExprLoc in another. The reason for that is that Clang records many relevant locations for each AST node. The developer of the clang-tidy check needs to know which location accessor method is appropriate or required for each situation. A further improvement is to change the casts to accept the relevant types of FunctionDecl and CallExpr – NamedDecl and Expr respectively. Let’s return to the check implementation and examine it. 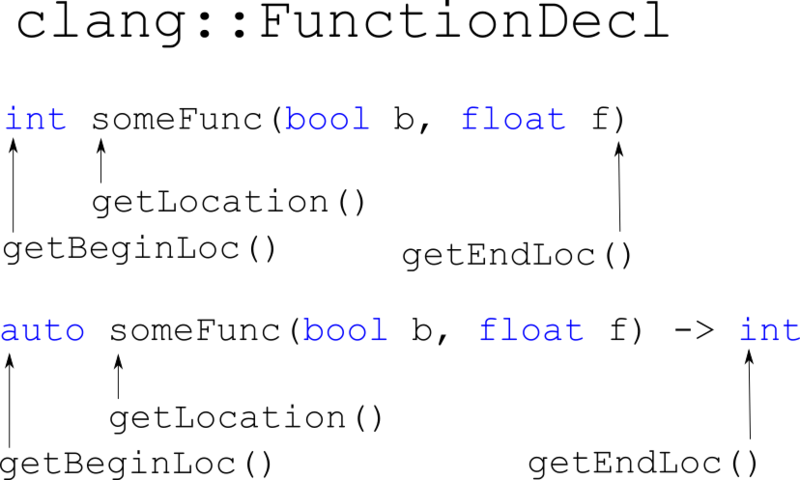 This method is responsible for implementing the rewriting of the source code as described by the matchers and their bound nodes. In this case, we have inserted code at the SourceLocation returned by either getLocation() or getExprLoc() of NamedDecl or Expr respectively. Clang AST classes have many methods returning SourceLocation which refer to various places in the source code related to particular AST nodes. For example, the CallExpr has SourceLocation accessors getBeginLoc, getEndLoc and getExprLoc. It is currently difficult to discover how a particular position in the source code relates to a particular SourceLocation accessor. clang::VarDecl represents variable declarations in the Clang AST. clang::ParmVarDecl inherits clang::VarDecl and represents parameter declarations. Notice that in all cases, end locations indicate the beginning of the last token, not the end of it. Note also that in the second example below, the source locations of the call used to initialize the variable are not part of the variable. It is necessary to traverse to the initialization expression to access those. clang::FunctionDecl represents function declarations in the Clang AST. clang::CXXMethodDel inherits clang::FunctionDecl and represents method declarations. Note that the location of the return type is not always given by getBeginLoc in C++. clang::CallExpr represents function calls in the Clang AST. clang::CXXMemberCallExpr inherits clang::CallExpr and represents method calls. Note that when calling free functions (represented by a clang::CallExpr), the getExprLoc and the getBeginLoc will be the same. Always chose the semantically correct location accessor, rather than a location which appears to indicate the correct position. It is important to know that locations on AST classes point to the start of tokens in all cases. This can be initially confusing when examining end locations. Sometimes to get to a desired location, it is necessary to use getLocWithOffset() to advance or retreat a SourceLocation. Advancing to the end of a token can be achieved with Lexer::getLocForEndOfToken. The source code locations of arguments to the function call are not accessible from the CallExpr, but must be accessed via AST nodes for the arguments themselves. Every AST node has accessors getBeginLoc and getEndLoc. Expression nodes additionally have a getExprLoc, and declaration nodes have an additional getLocation accessor. More-specific subclasses have more-specific accessors for locations relevant to the C++ construct they represent. Source code locations in Clang are comprehensive, but accessing them can get complex as requirements become more advanced. A future blog post may explore this topic in more detail if there is interest among the readership. Once we have acquired the locations we are interested in, we need to insert, remove or replace source code fragments at those locations. 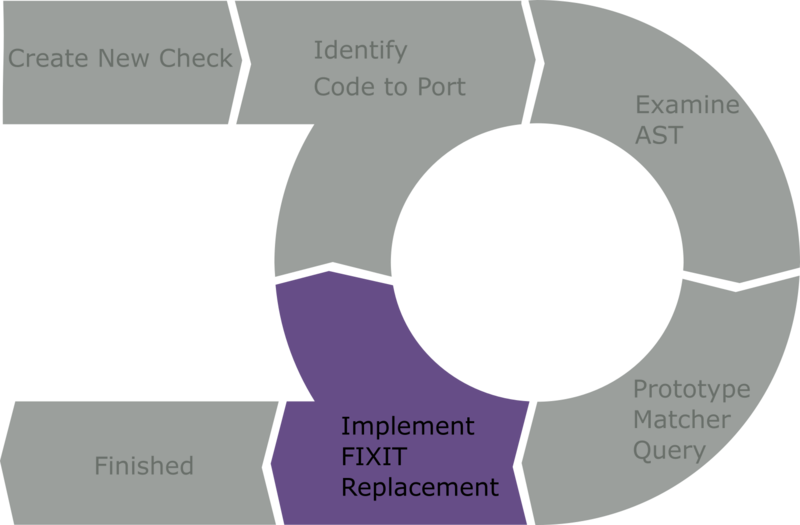 The diag method returns a DiagnosticsBuilder to which we can stream fix suggestions using FixItHint. The matcher part of this code is fine, but when we run clang-tidy, we find that the removal is applied to the entire function name, not only the awesome_ prefix. The problem is that Clang extends the end of the removal range to the end of the token pointed to by the end. This is symmetric with the fact that AST nodes have getEndLoc() methods which point to the start of the last token. Usually, the intent is to remove or replace entire tokens. This concludes the mini-series about writing clang-tidy checks. This series has been an experiment to gauge interest, and there is a lot more content to cover in further posts if there is interest among the readership. More tips and tricks from the trenches. This would cover everything you need to know in order to quickly and effectively create and use custom refactoring tools on your codebase. Do you want to see more! Let us know in the comments below or contact the author directly via e-mail at stkelly@microsoft.com, or on Twitter @steveire. I will be showing even more new and future developments in clang-query and clang-tidy at code::dive tomorrow, including many of the items listed as future topics above. Make sure to schedule it in your calendar if you are attending code::dive!